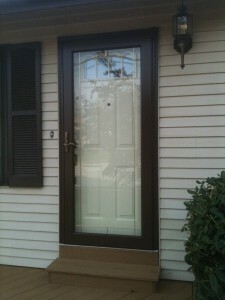 Storm Doors in Delaware | Homecraft inc. When winter snow or summer rain barrel through the Brandywine Valley, you’ll want to have the peace of mind of knowing that your home’s doors are protected with a quality, weathertight storm door. Extruded aluminum frame adds beauty to your door by virtue of a rounded cove molding along the glass edge of the extrusion. Corrosion resistant corner gussets enhance the structural integrity of the door. We offer a Lifetime Limited Transferable Warranty on all of our Homecraft® storm doors from ProVia. Call Homecraft®, Inc. at 1-877-494-0377 today to schedule a free in-home estimate for replacement windows or doors. Or simply fill out our convenient on-line “Request a Quote” form.